German speaking readers might remember my appeal in the July edition of the Swiss magazine JETSTREAM from 1997 „Save the Balkan Ilyushin IL-18“ (article „A Legend Is Disappearing“). This appeal was trying to keep this Soviet bird alive as long as possible with event and charter flights. This was twelve years ago. At that time, only a few airworthy IL-18s were remaining in Europe, which operated at very low cost. The Iron Curtain had just disappeared eight years before and the development of a „Nine Eleven“ scenario was not yet foreseeable. However, the enthusiast scene had not discovered the fascination of Soviet prop-liner aviation yet. Twelve years have passed since. By 2009, things had changed dramatically. With a time span of twelve years – our objectives and attitudes have had to be modified drastically. But what happened with this beautiful "bird" over the last decade? What a generation of Airbus, Embraer and Boeing knows of the beauty and elegance of turboprop aviation not only from Wikipedia sources, but from our own experiences of flying when flying was an experience and something to be relished, not just an excuse to take the traveler’s money. Who can remember the beauty of the IL-18, without doubt, one of the queens of all Soviet prop-liners? Nowadays we may find the wreckage of the IL-18 dumped at scrap yards, we may find them rebuilt as restaurants, we may find them exhibited in museums or we may find their remains on remote sites of civil war and in regions far out of reach for the aviation community in times after „Nine Eleven“. The world has changed and we may have now discovered „A Jewel in the Crown.“ Less than a year ago we received friendly guidance suggesting the potential charter of institutions focusing on the mental health of their patients, which was the day when we were "day dreaming of flying the impossible dream, of flying onboard an IL-18 in the year 2009... something that had seemed impractical and impossible! A brief look into the homepage of Air Events around December 2008 proved the cynics wrong. Sebastian Schmitz, Sven Maertens and Manuel Kliese – the owners of Air Events – hit the jackpot in Moldova, one of the last living aviation heritages of Soviet air enterprise of the old Soviet Bloc. They located and organized with the operator of ER-ICB IL-18 of Tandem Aero, one of the last worldwide operating passenger based IL-18, to finally provide one last chance for the real enthusiast to fly the IL-18. Air Events were about to prove to the world of enthusiasts just once again, that it is possible, with echoes of President Obama’s campaign slogan „Yes, we can!“. A trip to Moldova in 2009 is a challenge rather by price, than by entry requirements. Holders of a Western country passport do not require an entry visa for Moldova. However, the journey does not come cheap. Air Moldova offers direct flights from major airports in Western Europe. The best round trip bargain fare is offered by Air Moldova in cooperation with German Cirrus Air from Frankfurt for EUR 340. Carpatair offers flights from Munich via Timisoara (Romania) with Fokker 100, Moldovian flies with their Saab 2000 in cooperation with Hungarian Malev from Budapest, Air Baltic with their Fokker 50s from Riga, Austrian Arrows flies from Vienna with their Canadairs, and Turkish Airlines utilizes 737s from Istanbul. Also S7 Airlines from Russia offer the same but no one took this option. 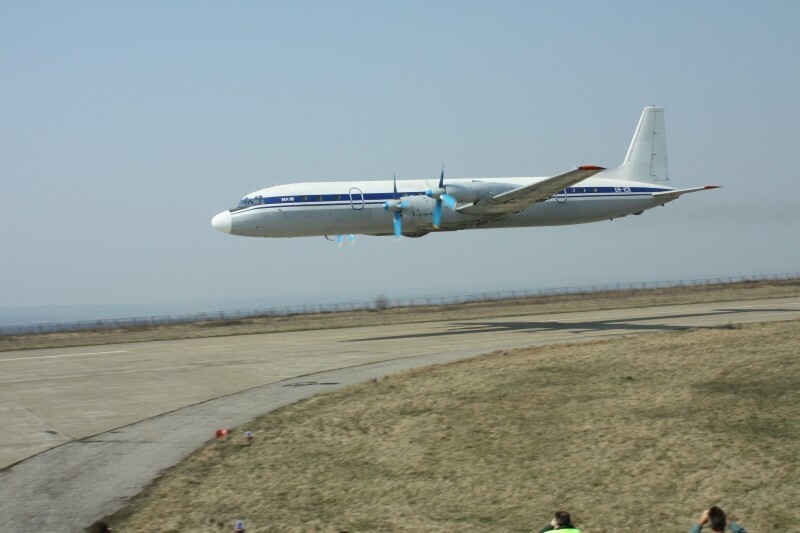 Around fifty aviation enthusiasts from all over Europe faced this fiscal challenge and arrived on Friday, April 3rd in Chisinau (Russian: Kishinyev), the capital of Moldova. At this time the weather had improved somewhat and the city was doused in glorious sunshine. The next morning welcomed us with CAVOC weather: clear skies, not a single cloud to be seen, quite unusual for April. For those who arrived in Chisinau after midnight, the early morning briefing set at 6:30 AM was a tough challenge. We met on the 17th floor of the „Cosmos“ Hotel, an old hotel with Soviet style smell and charm, but the breakfast was a typically superb buffet, such good food from such a poor country. Alexandr Marcenco – Alex –, who was our host in Moldova, gave us a briefing about the day’s schedule ahead. During the briefing we got an indication about what hospitality means in Moldova. This kind of hospitality, which we were about to experience, is unknown in the West. It became obvious what tremendous preparations that were necessary by Alex und Vitalii, our hosts and guides, and Tandem Aero the operator of ER-ICB – to make the impossible possible. After distributing Hi-Vis jackets for the ramp tour and having an excellent breakfast, we departed at 7:30 AM to the airport. All different kinds of languages, accents and dialects vibrated throughout the bus, people who knew each other from the internet, met for the first time and people started talking about this adventure, already at this early time of the day. After arriving at a clean and neat terminal we first proceeded to the check in counter. We counted eight departures on the display board in the departure hall, including our flight TQ 1410 (Operator: Tandem Aero, Owner: Grixona) to Bălţi (Russian: Beltsy) on this Saturday morning. Our flight was probably the first and last domestic flight in Moldova. The second largest city in the country is situated only 118 kilometers north of Chisinau. After passport control and security we proceeded to the departure hall, bathed in bright morning sun. All duty free shops and the bar were opened only for our flight. Equipped with state of the art video and camera equipment, everybody rushed towards the gate and there she was! Our ER-ICB was standing there majestically bathed in bright sun, just across the terminal. A great old Soviet lady! In order to give everybody sufficient time on the ground for photo and video shooting, a generous half an hour was planned at the side of the aircraft. Then we started boarding the bus, which brought us to the IL-18. Alex, Vitalii and CPT Vladimir Russu, one of the most experienced IL-18 flight veterans in the world, waited for us in front of the plane. Vladimir still had a few surprises prepared for us. After everybody had filled his memory treasure box with precious Megabytes, it was time for departure. There were no seats assigned at check in, so most of the passengers rushed to the rear steps to get the best seat onboard. On board we could not find any seat numbers above the seats indeed. Unfortunately taking good pictures was not possible from every window, because many cabin windows had been misted from the outside over night. We all were rewarded with a deafening engine sound emerging from four roaring Ivtchenko AI-20, which we had forgotten after so many years of becoming accustomed to the sound of engines used mainly by Airbus, Embraer and Boeing. Captain Vladamir Russu fulfilled our request and pushed up the engine thrust to full power before take-off, which led me to believe that the plane would be torn apart any minute. This is what we call real 5.1 Dolby Surround! Capturing this noise level on tape is quite difficult and the result often disappointing. The automatic audio tuning of an ordinary video handy cam levels the sound peaks especially of planes like an IL-18 in full power. This is disappointing indeed, however there is nothing much that could be done about it. After take-off on runway 26 in Chisinau we took a right turn to the north and flew IFR on a flight level of 6,000 feet direct to Bălţi. A short flight time of just 22 minutes left only little time to explore the cabin and cockpit. A long queue has formed in front of the cockpit and Alex tried his best to grant everybody access into the holy grail of the IL-18. Shortly thereafter the plane started descending, engine power was strongly throttled and the plane touched down noticeably at 10:33 AM on runway 33 in Bălţi. There was absolutely nothing to see, except a beautiful AN-12BK ER-ADP with a red center cheat line, no titles with any reference to its owner and a rusty, fully manually operated passenger staircase for disembarkation. We consequently parked directly on the runway with nose direction 15 and everybody started taking pictures. Not long after and this deserted airfield was fully crowded with 50 „nerds“ in bright yellow jackets. Around 11:35 AM Captain Russu started all four engines again and taxied all the way down the runway to the holding point of runway 33. Meanwhile 50 enthusiasts on the ramp got their photo and video equipment ready. Shortly thereafter Charlie Bravo thundered down runway 33, rotated, remained for seconds in a flat parallel position to the runway, just centimeters off the ground, and then took a steep climb belching four impressive black trails of heavy exhaust smoke behind. After an athletic right- leftward curve, the IL-18 thundered down runway 15 from the opposite direction with fully retracted undercarriage in-flight position, just roughly 10 metres off the ground, a performance well worth considering a note in the „Guinness Book of Records“. Shortly after, she landed again from the south on runway 33, altogether a spectacular flight performance of just seven minutes in the air, the shortest flight it may have ever experienced. Once returned to on blocks position, everyone took a well deserved short break from all the excitement. All of a sudden, three very attractive young „cheerleader“ ladies in somewhat cool looking outfits entered the scene, posing for cameras and an interested audience in front and around Charlie Bravo. However, not even these beauties were in any competitive position to steel our star of the day – Charlie Bravo. Back on board, the Moldavian television crew conducted a short interview amongst the passengers. It was difficult responding to the simple question: „Why are you interested in this plane?“ and just replied ...„because we love this plane!“ We could easily detect from the face of the interviewer that she was not too happy with this bland and bizarre comment. Now it was about time to bid farewell to Bălţi, i.e. to its runway. Around 12:35 PM our four heavy props started rotating again and our IL-18 taxied all the way down the runway to the holding point of runway 33. After a beautiful flat take-off Captain Russu waived „Good Bye“ to Bălţi with the grand old lady’s wings, an old aeronautical tradition. This time we flew back VFR just 1.500 feet off the ground. Two spectacular low passes were to follow. We flew the first low pass over the old military airfield Marculest and the second one over the airfield Vadu lui Voda in the vicinity of Chişinău. Before landing, we circled in a long left turn over the city of Chişinău and after 41 minutes in the air we finally touched down on runway 26 at the airport of Chişinău in bright sunny skies, enjoying full reverse thrust of four powerful Ivtchenko AI-20 prop engines. After thorough immigration inspection (something seemed wrong with a particular passport) and many suspicious looks in the arrival area, the next surprise of Alex was due to follow. Soaked wet and completely dehydrated the author allows himself time for a short rest and a bottle of mineral water. Then we were expected at the staff entrance and security check point of Chisinau airport. Once again we were told to put on our Hi-Vis jackets and our passports were collected for the duration of the ramp tour. On the entire ramp in Chisinau it is strictly prohibited to take pictures under normal circumstances, Alex however had managed in countless negotiations with the airport and security authorities to obtain permission for a photographic ramp tour on foot, which could only be possible through strict group discipline. It was important that the group stay together and nobody walk ahead or stay behind, and people refrain from taking pictures of old buildings. We then walked across the ramp approximately one kilometre to the Western part of the apron. What we saw there, was the complete retired fleet of the former Moldovan division of Aeroflot in many different colour schemes and shapes, what a sight! Then, fifty people in Hi-Vis jackets with high tech camera equipment passed by the passenger terminal -airside-, one-by-one, walking two kilometres, all the way down to the Eastern part of the airport, with security personnel by the road observing us with suspicious eyes. This surely never happened before in the Republic of Moldova! The crew of Austrian Arrows surely could not believe their eyes, as we passed by one-by-one- on one of the most undoubtedly quiet and restricted airports on the world. As the shadows of the afternoon sun grew longer and longer this was a subtle reminder that we had been on our tired feet for just eleven hours, one of our fellow participants having left the tour earlier was on board the Austrian Arrows Canadair which we saw heading for Vienna onboard with the friendly crew who waved to us, when we passed by. Most of us were heading back to the „Cosmos“ hotel, where it was time to say „Good Bye“ to Alex, Vitalii, Sebastian, Sven and Manuel. We were quite sure that we would meet again some day. An unforgettable weekend was coming to an end. Some of us just fell into bed, others had a good tasting beer called „Chişinău“ at the reception bar of the hotel. In the evening we visited the apartment of Captain Vladimir Russu. We must thank Alex for the excellent gourmet meal in the „very“ expensive Moldavian restaurant and the free use of that little green car. Vladimir showed us a small fraction of his videos featuring his impressive flights on IL-18 throughout the African continent to some of the most remote and adventurous places on this planet. Vladimir is not only a true veteran of aviation, what is more, he has passion running through his veins. He truly loves his job, he considers the IL-18 „his“ plane and even renovates „his“ cockpit panels in his free time and keeps the plane in perfect running order. Vladimir tackles just about any challenge and is fully enthusiastic about new technological developments. Everybody could notice how happy and touched Vladimir was about our love for „his“ aircraft. Sadly it is time to leave as a „certain“ person has to be back at the hotel by midnight – to catch his flight home. Somewhat curiously, before leaving in a taxi back to the Hotel Cosmos, our English collaborator is accosted, for the very polite request for two English cigarettes. Daniel would like to thank the extraordinary and professional team in Moldova, to Alexander Marcenco, Vitalii Ambarlii , to Captain Vladimir Russu and First Officer Sergei Ivanovich and crew for their unlimited devotion to this special event, your enthusiasm and your hospitality was beyond our expectations imagination. A big „Thank you“ to Grixona CEO Mr. Ghilan and to Mr. Kobelev and to Tandem Aero for making our dreams come true! Furthermore we would like to thank the authorities and government officials of Moldova, and especially to Mr. Conovalov (Head of CAA security) for your cooperation and understanding of this historic visit, without your kind understanding of our passion, this project would never have been taking place. Fifty grateful participants will keep Moldova, its people, their hospitality and open mind and its great aviation history in their best memory. Also, we would like to forward our acknowledgement to CEO of Chişinău International Airport Mr. Roman Podcoritov. Mr. Podcoritovs big support was unevitable to make this historic day come true. A big „Thank you“ for granting us your kind permission. Thank you very much to the sponsors of photographs and video clips. These are unmatched historical documents. Thank you especially to Alex Marcenco (Chisinau, Moldova), Andrey Gridyushko (Odessa, Ukraine), Steve Kinder (United Kingdom), Thomas Rothlin (Lieli, Switzerland), Sven Maertens (Essen, Germany), Felix Reimann (Essen, Germany) and Manfred Poznanski (Mörfelden-Walldorf, Germany) for sharing with us their best of this weekend. Last but not least, without Air Events’ determination to carry through this project, even though it was difficult to reach the required minimum number of participants in the required time, this trip would never have taken place. Thank you to Sebastian, Sven and Manuel for making so many peoples dreams come true and to prove our critics wrong! Aviation in Moldova is currently undergoing the most difficult transformation process in its history. Aging equipment and an aircraft fleet mainly sitting on the ground are the result of a severe lack of investments and cash flow. In order to prevent Moldavian carriers to be banned by a resolution of the European Commission dated July 4th 2007, Moldova proactively revoked the Aircraft Operators Certificates (AOC) of eight carriers (Valan International Cargo Charter, Pecotox Air, Jet Line International, Jet Stream, Aeroportul International Marculesti, Aeronord Group, Grixona und Tiramavia) and virtually chained nearly the complete aviation of the country over night. One of the results was that Grixona lost its operator's certificate and it seemed, ER-ICB would never see the skies again. In the meanwhile all formal requirements were met and since 2008 ER-ICB is operating charter flights to Juba (South Sudan) and Erbil (in North Iraq) again, we hope for long. The airport is situated 14 kilometres south of Chisinau. Compared to Western European standards, the airport is rather small and operates a runway with a length of 3.590 metres in East-West direction (08/26) and is equipped with CAT II. The airport has been modernised in the past few years. The small terminal is makes a neat and clean impression, ways from to the gates are short and easy. Due to the lack of an own maintenance hangar with a roof, smaller repair works are performed outside on the ramp. Larger repair work is performed during scheduled rotations or regular planned letter checks in maintenance facilities abroad. Passenger figures are rising again, however have not yet reached the mark of a million passengers per year. In 2008, 850.000 passengers arrived or departed in Chişinău. In the next years, foreign aid from the EU will be used to further modernise the infrastructure of the airport. In front of the terminal a TU-134A with the titles of Moldova thrones on a base of stone and is undoubtedly an impressive eye-catcher for every visitor of the airport. The former registration ER-65036 has been removed in the meanwhile. During the night, the plane is illuminated by spotlight from all sides. The Tupolev is located here since September 11, 2005 when she was flown with a helicopter in one piece in a spectacular action to her final resting place. Unfortunately there are no interesting spotting locations in or around the airport, because the complete apron is treated as a military zone and photographing is strictly prohibited. Flight movements in Chişinău are – with the exception of charter flights – not very interesting for spotters. Only those aircraft with flight operations are positioned on the apron in front of the passenger terminal. All other aircraft are towed far away out of sight to remote parking positions. The biggest treasures of this airport are parked far away from the terminal on remote spots and could be fully explored during our unforgettable ramp tour in April, 2009. The airport Bălţi-Leadoveni is situated 15 kilometres in the north west of downtown Bălţi in northern Moldova. Bălţi-Leadoveni is the second largest airport in Moldova and one of two airports (airfields) within the vicinity of Bălţi. The second airport is called Bălţi – city and is located within the city itself. The operator of Bălţi-Leadoveni is the state owned Moldaeroservice corporation. This corporation is part of the national „S.A. Moldaeroservice“ holding. During the economical crisis in the 90s all restructuring plans were put on ice and the Moldovian aviation industry slipped into a deep recession. The runway in SES-NWN direction (15/33) has a length of only 2.208 metres and is rather short. There is no scheduled traffic and the only highlight is the parked „ownerless“ AN-12BK ER-ADP.